An old fashioned way to replace teeth is with dentures. This replaces the appearance of teeth but the dentures in no way function like real teeth. 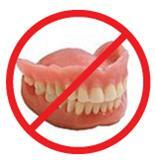 If you suffer with old fashioned dentures you know the dentures are uncomfortable, unstable, annoying and painful. The dentures merely float on the gum tissue. This allows the dentures to fall out during talking, laughing and eating. Pasadena, Texas Dentist Dr. Nugent can make dental implant dentures that are stable and secure. The dentures “snap” onto the dental implants creating a secure and stable platform. Get rid of messy, gooey denture adhesives. Get rock solid dental implant dentures. Pasadena, Texas Dentist Michael Nugent is a family dentist that is located at 3421 Burke Rd Ste A, Pasadena, Texas 77504. He has been voted “Best Pasadena, Texas Dentist” multiple times. Experience life again when you upgrade to dental implant dentures. Call our office for implant denture consultation at 713-941-8261.